Historical credit data are vital for a host of credit portfolio management activities: Starting with assessment of the performance of different types of credits and all the way to the construction of sophisticated credit risk models. Such is the importance of data inputs that for risk models impacting significant decision making / external reporting there are even prescribed minimum requirements for the type and quality of necessary historical credit data. This is the first blog post of a series dedicated to the discussion of synthetic credit data. What are synthetic credit data? The use of synthetic data has become increasingly popular in many areas of machine learning that use classification algorithms (also called supervised learning). A common issue that is being tackled this way is addressing the (non-)availability of labelled data, namely data that include both the characteristics (attributes) of an entity (e.g an image of a coffee machine) and the label (identification as a ‘coffee machine’). 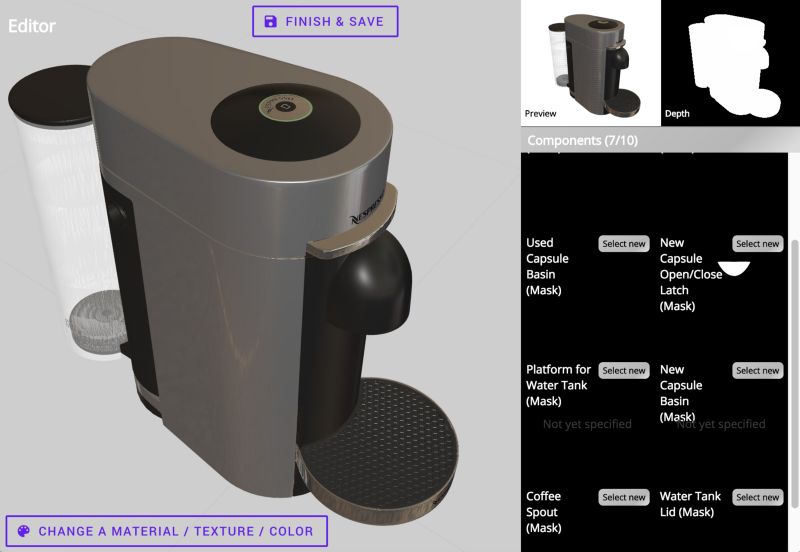 In the optical recognition example the synthetic data problem can be approached by generating programmatically (e.g using a 3D rendering system) graphical representations of coffee machines (among other objects), thus producing data with known characteristics. An optical recognition system can thus be trained on such data, before being fine-tuned using the more scarce (and expensive to procure) real labelled data (images of coffee machines that have been recognized / identified by humans). Synthetic credit data generation aims to overcome some of the challenges of inadequate historical credit data with the production of high-quality, controlled and fully understood data samples. The essence of the method is to employ a collection of consistent generative models that create synthetic snapshots of the initial and future states of a desired credit portfolio. The data sets thus generated can then be treated as historical data sets, allowing for a variety of uses. The generative models can be trained on existing real data but also tuned with the use of expert insights to create data sets that closely resemble the expected properties of actual data. With sufficient effort synthetic credit data can be made indistinguishable from any available real data (in a statistical sense) as the generative algorithms can be made to essentially include all available information. Synthetic Credit Data generation can be thought as a case of large scale missing data imputation. The difference with usual approaches to data imputation is the different tolerance to possible bias and distributional assumptions. In missing data imputation a great deal of thought must be dedicated to avoiding the introduction of biases. In contrast, in the case of synthetic data, the selection and use of the underlying generative models is by definition opinionated and expert based. This is an most important aspect to keep in mind when as it determines the acceptable use of the generated datasets. Mathematically we can represent the relationship of generative models with credit risk classification systems as follows. A credit risk assessment model is a mapping \(f\colon X \to Y\) of observed measures (denoted also as covariates, charecteristics) X to a credit outcome Y, expressed as the conditional probability \(P(Y|X)\). Given the generative model, conditioning on X to obtain simulated outcomes \(P(Y|X)\) is (conceptually) simple. In addition it opens up the possibility to calculate \(P(X|Y)\), namely the realizations of observed variables X consistent with a set of outcomes Y, which is known in risk management context as reverse stress testing. Synthetic data may be generated to meet specific criteria that are not found in the actual historical data sets but may be expected to present in production environments. The aboundance of synthetic data means that the relevant IT systems can undergo more comprehensive design and testing. It also provides flexible means to train personnel to use the systems in a realistic context similar to what they will encounter in production. The flexibility inherent in the specification of synthetic credit data can be useful for simulate not yet encountered conditions: Where real data does not exist, synthetic data is the only solution. This approach helps to better take into account rare unexpected scenarios. As mentioned above the intrinsic potential to perform reverse stress testing can be considered as a bonus that comes with the adoption of a full generative model. Help test the sensitivity of algorithms to common statistical problems (sample size, missing data). A typical circumstance where real data (almost by definition) is completely absent is when a new business initiative is launched or a new credit product is released. In this case the judicious use of generative models can help prime the entire pipeline of tools and models associated with a new product release, thereby significantly reducing the associated risks. It is worth adding to the specific list above some more high level, but not less important benefits of readily available synthetic datasets: It liberates quantitative / data science teams to develop in-depth understanding of the overaal systems and algorithms at their disposal, rather than being conditioned by the (typically quite real) limitations of available datasets. In essence it enables data science teams to fulfill better the science part of their role: Enabling for example gedanken experiments and exploratory studies with minimal time, cost and project risk. There are obvious challenges to generate faithful synthetic data for complex credit systems and behaviors. The generative models creating the synthetic data must be estimated and validated on the basis of factual information about the system being modelled and the very motivation for the exercise is the relative absence of data! The key to unlocking the potential of synthetic credit data is to understand the impact of their limitations. This impact is a function of the nature of the system being modelled (its complexity), the amount and quality of available real data and the appropriateness of any modelling assumptions (the existing expertise and know-how). Generating synthetic credit data is an important process in its own right and may inadvertently introduce issues (hence costs and risks). It is therefore important that it becomes a recognized element of the model lifecycle rather than be a “hidden” and ad-hoc tool in model development.